W 1890. 19TH CENTURY SCRIMSHAW MANTLE ORNAMENT featuring a large pair of engraved sperm whale teeth. 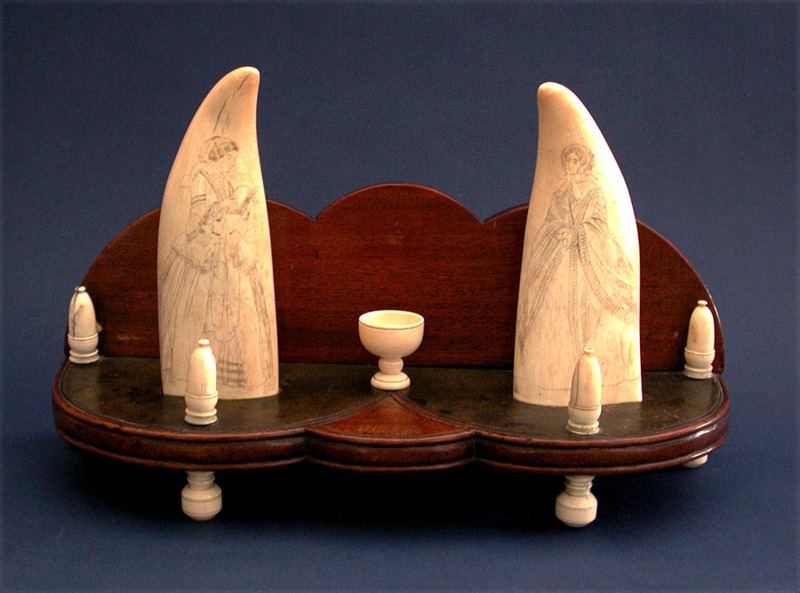 Nicely fashioned teakwood stand that is decorated with turned whale ivory feet, acorn finials and accessory cup. All the wood curved, shaped and decorated with deeply incised lines. The teeth measure 8" h. x 2 3/4" w. Each are nicely engraved with full portraits of well dressed females, one reading a book and the other with folded hands. Overall width 15 1/2" x 9" h. x 5" deep. Condition excellent throughout. Wood with original varnish finish and fine age color. Teeth with light, even age patina on the front and a bit darker color on reverse. Circa 1840. A fine example of a, hard to find, period presentation of scrimshaw teeth. Very eye catching.